It’s the same old story, prince meets princess, princess falls in love with prince, jealous witch turns prince into frog and kidnaps princess. Depressed frog sits next to river, (until some shameful in-game advertising goes floating by), sees the bottle and decides to drink the stuff. It’s not a good idea to drink things you find floating down the river. The aforementioned drink turns our depressed frog into Superfrog, who then sets off to rescue the princess and defeat the witch. There are 6 worlds to play in this great platformer from Team 17. 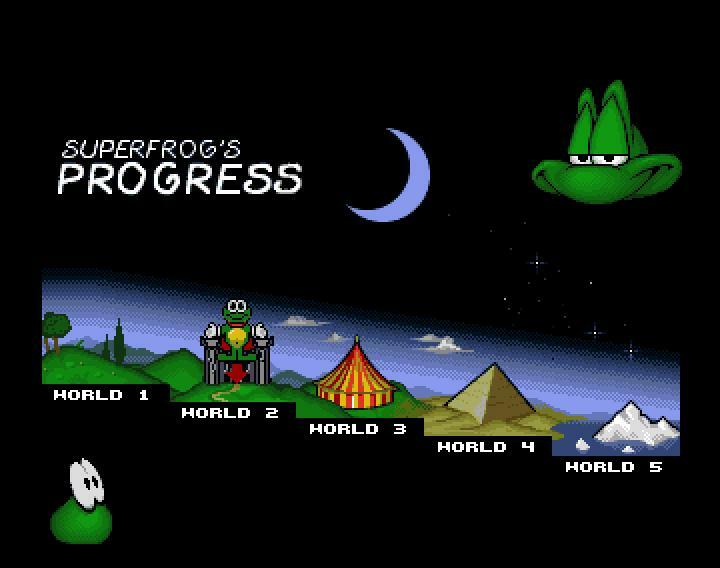 Starting off in the Magic Woods Superfrog battles his way to the witches ‘Spooky Castle’, and is then transported through a number of twists and turns to a fun park, ancient world, ice world (always seems to be a standard level), space level (frogs in space?) down to the final confrontation with the witch. The levels within each world have the same objective, collect enough gold coins to open the portal to the next level and so on. Each level is designed to be challenging with just enough enemies to keep you on your toes, although this can be adjusted in the options menu between normal and hard. There are many items to collect including coins, fruit and jewels and special items including wings, red nose (invisibility), a strange bogie like side kick you can lob at enemies and energy drinks to re-fill your meter, also keep an eye out for secret passages. Blindly running into walls (only in-game) seems to be the best way to find them. The graphics are great and everything is nicely drawn, Rico Holmes, Eric Schwartz have both created a game where each world has its own distinct theme, design and enemies to defeat making the game play varied and interesting. Too many platform games feel like they repeat themselves after only a few levels but this one doesn’t. The intro sequence is amusing and a nice touch in setting up the story for our hero and the music is actually pretty good, with a different score by Allister Brimble created for each world. I keep mentioning annoying and repetitive music in some of these old games (no pleasing some people) but for once I am quite impressed. Superfrog’s only real downfall is the control of its hero. For a character that can move so fast and who seems to have been the Amiga’s answer to a certain blue hedgehog, the levels aren’t really designed to support that kind of character. 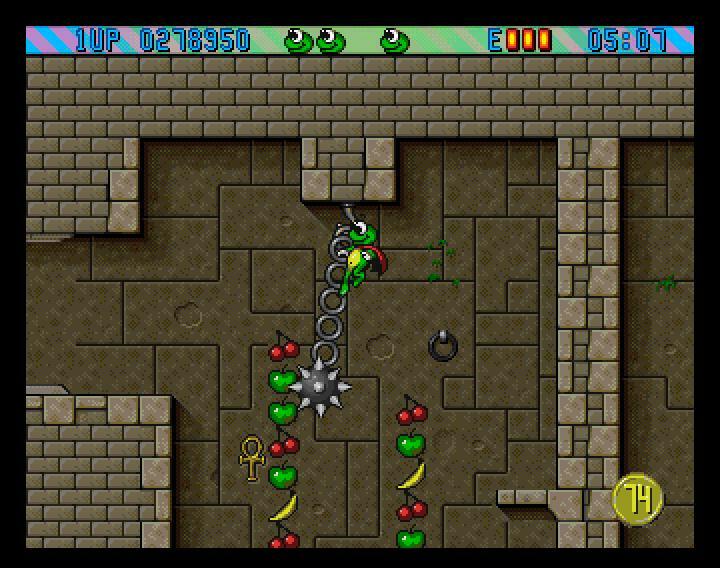 The game play can be very fast and frustrating at times as running into enemies and especially spikes can happen quite often. The game has very few flaws but the more specific annoyances come in the form of being killed when running into the sides of spikes (even Sonic didn’t have that trouble). 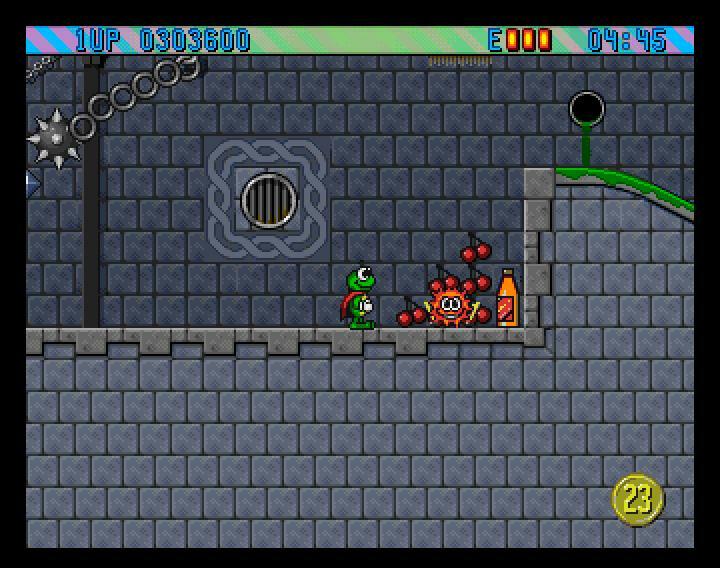 When playing you will want to move Superfrog quickly, because he was designed that way, but in fact you need to move him relatively slowly and carefully, otherwise it would be like trying to run as fast as possible through a mine field in the hope you don’t step on one. Once you get used to the speed and used to the fact you can’t just go hurtling off the game is brilliant fun and highly playable. 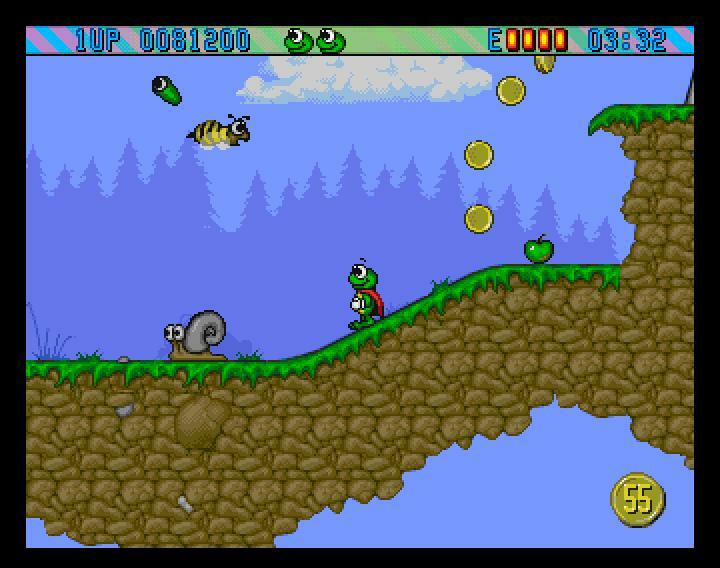 Asides from the control issues, Superfrog performs well in all other areas such as level design, graphics, music and playability. I love coming back to this game and love the animated intro sequence, although I’m never too happy about blatant product placement in games but I think I can forgive Superfrog (and Lara Croft for that matter). 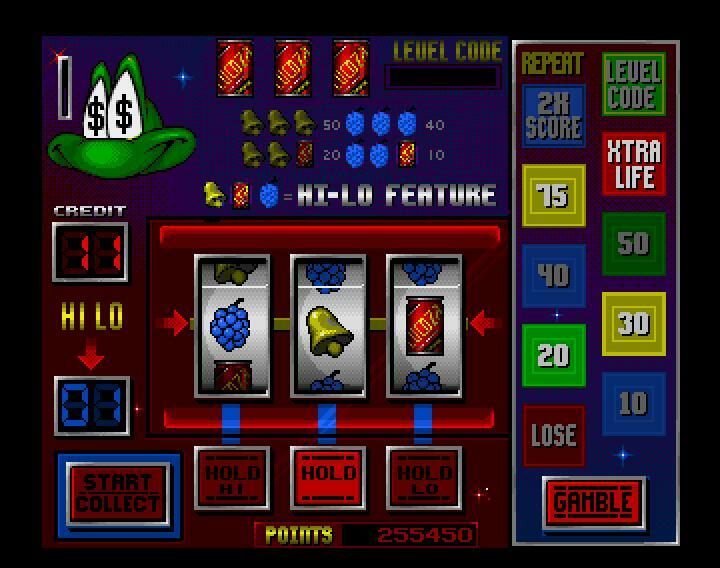 After each level there is a ‘gamble option’ which opens a great little side game which enables you to gamble coins in order to score more points (up to x2) win extra lives or a level code, it breaks up the game play nicely getting you ready for the next set of levels. 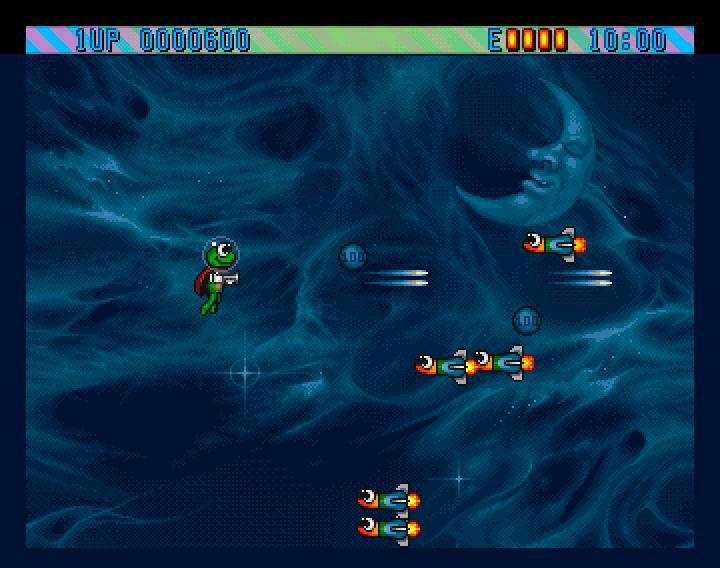 Superfrog is a brilliant game from Team 17 and one that has stood the test of time. GREAT ! Review, THANX !! 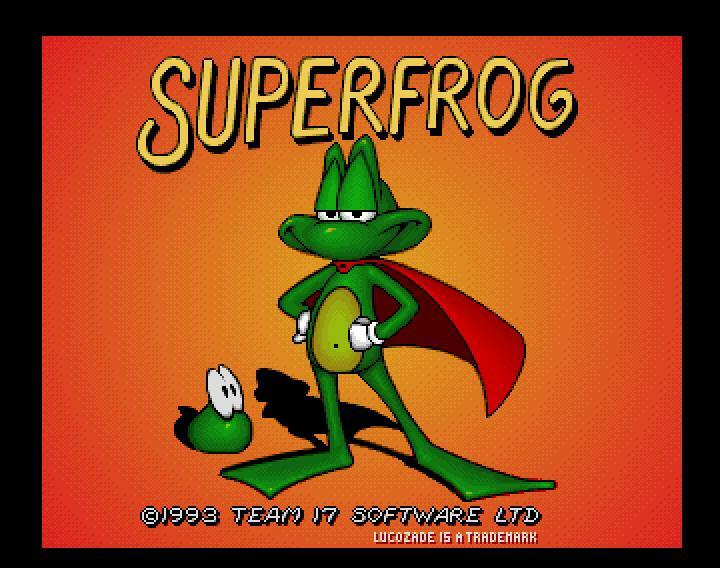 , I love SUPERFROG ! Awesome review for an awesome game!